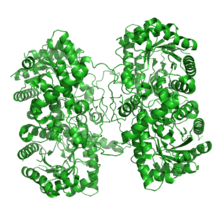 Crystal structure of rat liver betaine homocysteine s-methyltransferase. This enzyme belongs to the family of transferases, specifically those transferring one-carbon group methyltransferases. This enzyme participates in the metabolism of glycine, serine, threonine and also methionine. In humans, there are two isozymes, BHMT and BHMT2, each encoded by a separate gene. BHMT is expressed most predominantly in the liver and kidney. Anomalies in homocysteine metabolism have been implicated in disorders ranging from vascular disease, autism, and schizophrenia to neural tube birth defects such as spina bifida. ↑ PDB: 1UMY​; González B, Pajares MA, Martínez-Ripoll M, Blundell TL, Sanz-Aparicio J (May 2004). "Crystal structure of rat liver betaine homocysteine s-methyltransferase reveals new oligomerization features and conformational changes upon substrate binding". J. Mol. Biol. 338 (4): 771–82. doi:10.1016/j.jmb.2004.03.005. PMID 15099744. ↑ Pajares MA, Pérez-Sala D (December 2006). "Betaine homocysteine S-methyltransferase: just a regulator of homocysteine metabolism?". Cell. Mol. Life Sci. 63 (23): 2792–803. doi:10.1007/s00018-006-6249-6. PMID 17086380. ↑ Garrow TA (September 1996). "Purification, kinetic properties, and cDNA cloning of mammalian betaine-homocysteine methyltransferase". J. Biol. Chem. 271 (37): 22831–8. PMID 8798461. ↑ Sunden SL, Renduchintala MS, Park EI, Miklasz SD, Garrow TA (September 1997). "Betaine-homocysteine methyltransferase expression in porcine and human tissues and chromosomal localization of the human gene". Arch. Biochem. Biophys. 345 (1): 171–4. doi:10.1006/abbi.1997.0246. PMID 9281325. ↑ Chadwick LH, McCandless SE, Silverman GL, Schwartz S, Westaway D, Nadeau JH (November 2000). "Betaine-homocysteine methyltransferase-2: cDNA cloning, gene sequence, physical mapping, and expression of the human and mouse genes". Genomics. 70 (1): 66–73. doi:10.1006/geno.2000.6319. PMID 11087663. ↑ Szegedi SS, Castro CC, Koutmos M, Garrow TA (April 2008). "Betaine-homocysteine S-methyltransferase-2 is an S-methylmethionine-homocysteine methyltransferase". J. Biol. Chem. 283 (14): 8939–45. doi:10.1074/jbc.M710449200. PMC 2276374 . PMID 18230605. Klee WA, Richards HH, Cantoni GL (1961). 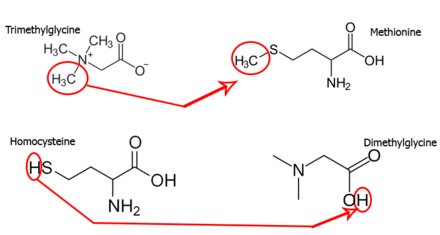 "The synthesis of methionine by enzymic transmethylation. VII Existence of two separate homocysteine methylpherases on mammalian liver". Biochim. Biophys. Acta. 54: 157–64. doi:10.1016/0006-3002(61)90948-9. PMID 14456704.